Hey Friends, Today i would like to share an interesting article via where you can easily make money online. I hope you all liked my previous articles. Do commenting guys and if you find any doubts then feel free to ask. Anyways, lets concentrate on post, i think when we talking about money all are interested, isn't it! Its obvious today's generation is always in hurry to earn lots and lots of money. Blogger, the word which we relate with our future investment or future earning, isn't it! Well, i think 85% of people having their blogs. So their is a good news for all of them. 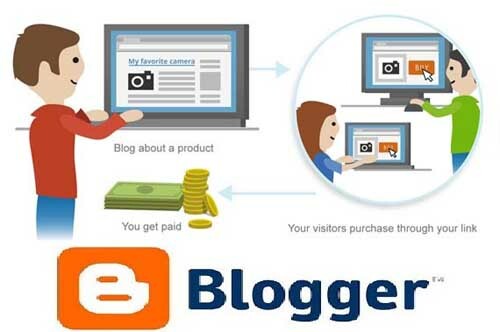 The good news is that “Google launched the Affiliate Ads for Blogger. And now blogger users can place a affiliate product links/banners to monetize/upgrade their blog without touching any code. Now Google announced their new advertise service named Google Affiliate Ads. Lets go through with whole article. If you have an blog, then you can easily make money online. Only you have to do just write interesting and unique articles for your audience. Remember your blog niche should be perfect and relevant to your articles contents. Keep in mind guys, that readers love to know latest information time to time. And Google always appreciate unique contents. So try to do something different. Go to your Blogger account and clicks on the Earnings Tab. You will find a option a “Get Started” click on it and follow the rest of the process. If you already have an Google Adsense then you'll need to sign up for one to get started. Simple naa! 2) Affiliate advertising on your blog. Google AdSense affiliate ads are not "Pay Per Click", with Affiliate ads you earn a commission when a reader clicks through and buys the item/product. The service is limited to the US people. People outside of US can’t use this feature yet. However it’s fresh feature and will take time to mature.